Chepstow On Tuesday brought about some excellent racing but for the At The Races cameras that wasn't the highlight of the day they had picked up. 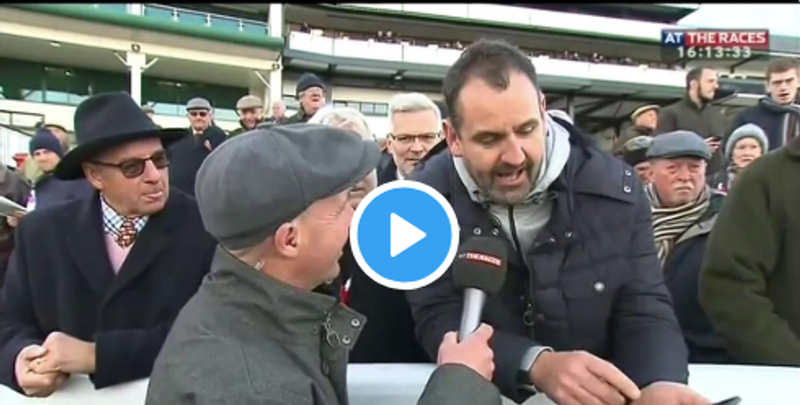 When crossing live to Luke Harvey, he was speaking to some punters and one of them had on his phone a bet from his friend that consisted of a 25p Lucky 31 that was waiting on one horse. A lucky 31 is a five selection bet consisting of 31 bets in total. They are split into five singles, 10 doubles, 10 trebles, five four-folds and a five-fold accumulator. Named after its 31 parts and the wide variety of bookmaker bonuses to be had, If one or more selections win this bet is guaranteed to land a money return. He was offered a cash out of £8,800 with just the single horse to run at Chepstow and he let it run. Gaelic Flow then went on to take the 18 runner handicap hurdle at 4:00. Bryony Frost was on board Gaelic Flow that won the race and luckily for the blokes mate he did not cash out and landed the prize of £33,000, What a remarkable bet. The man in the crowd who was explaining the bet was seen praising Bryony Frost as she walked past with a picture of the two of them congratulating each other. The mystery man is named Mr Pickard and his friend suspiciously left it at that, after winning such a substantial bet at a mid week Tuesday meeting you have to take your hat off to him.